Pour 2 to 3 inches of vegetable oil into the bottom of a heavy-bottomed dutch oven or deep skillet. Heat the oil to 350°F. 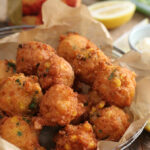 In a large bowl, stir together the hushpuppy mix, egg, corn, shrimp, salsa, green onions, and Creole seasoning. Allow to rest for about 3 minutes then stir again. Carefully drop heaping tablespoons of the batter into the hot oil and fry for 5 to 7 minutes or until golden brown and cooked though. Serve warm with a dipping sauce if desired.